This month we open inner spaces and possibilities, connecting to our heart chakra, cultivating love, gratitude, compassion and finding inner ressources, both in our yoga practice and our daily life. We will start with a meditation, breathing practice and flow through our asana practice, building up pace, strength and stamina. Ongoing offer: 5 classes for £45. Validity 2 months. Buy 8 classes and get the next one free. (validity 3 month). – the vibes, the atmosphere. Dim, candle light, soulful music, delicate fragance, beautiful souls. 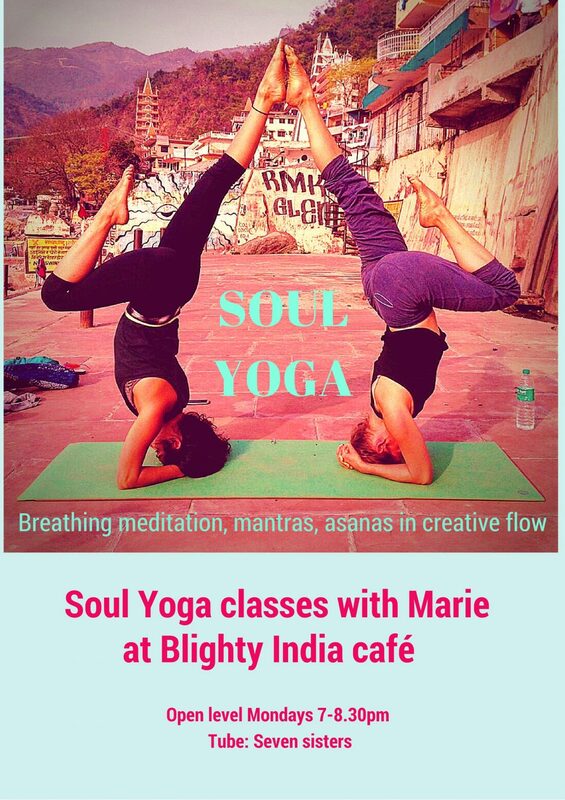 Soul yoga follows the structure of a yoga class while keeping a continuous creative flow. Influenced by Marie’s background in dance and choreography, each class sets a different focus, from an anatomical or poetical reference to moving structures such as spiralling, extending and flexing, finding qualities, uncovering relationship with the inner- outer world… allowing self-research and playfulness.